1. What is Live Painting? John's Live Painting services means having Fine Art take place at your event. He arrives with his easel, paints, and some examples of his completed work, and then entertains you and your guests by executing a beautiful painting in his unique Direct Painting approach right there before your eyes! With John, a classical artist in the Boston School, you bring the training and tradition of the Masters to your occasion, whatever that may be. It is a unique experience that is bound to make your event more memorable and interesting! The details of how exactly it comes together are totally customizable to your particular event; contact us today to discuss how it could work in to what you have planned! John works in the Direct Method - no sketching! 2. What kind of events does John do? 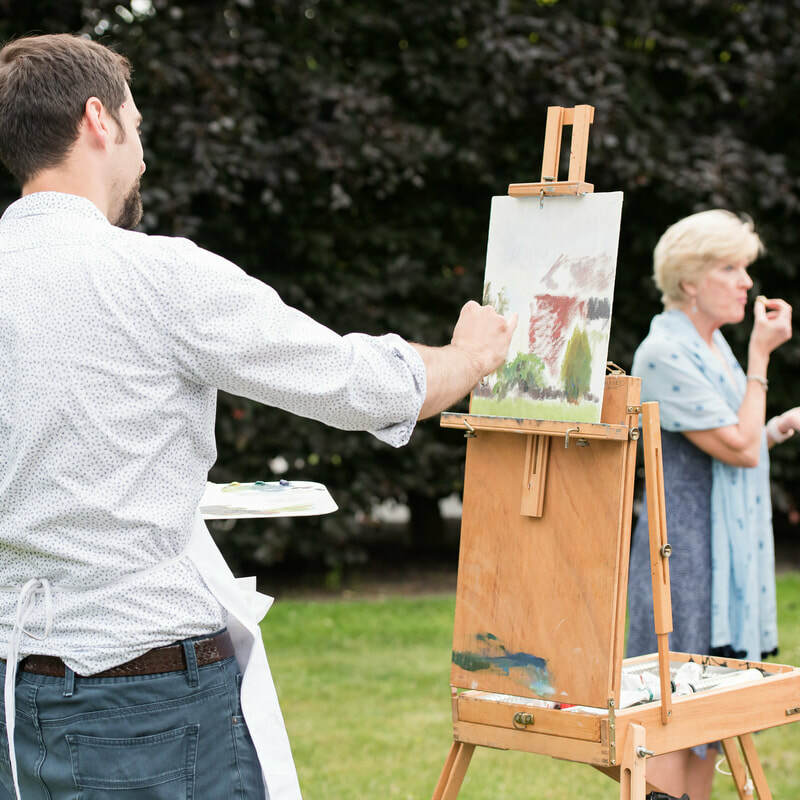 From a small, intimate gathering to a huge gala, John can paint at any event - really. Social gatherings, corporate events, weddings, galas, dinner parties, indoor, outdoor... yes. John is primarily available for events in the Worcester, MA area and greater Boston area, including southern New Hampshire. He is happy to work throughout New England and anywhere, really! 3. Can John give a private painting demo to my guests/group/association? Yes, and your group is sure to love it! For the most educational, informative, and fascinating experience of John's technique, please let us arrange a painting demo for your VIP clients, your friends, or other intimate group (6-20). John's Direct Painting method lends itself particularly to a delightful and entertaining Live Painting experience. Click here to learn more about John's Painting Demonstrations. 4. Can we purchase the painting John does at our event? Absolutely! If you would like to keep the painting as a memento of your event, we are happy to arrange a sale. For an event, John's standard painting size is 16"x20" and costs $600. We can also make arrangements for a custom size - just ask! 5. Can you give me specifics about working with you for my event? Reach Out: Contact us to reserve your date (better do it sooner rather than later, to make sure he's free!) Email or hop on the phone with Deirdre, John's wife and studio manager. Tell her about your event, what you're looking for from John's Live Painting, your hopes and dreams, etc. Deirdre loves event planning and is happy to think through details with you. Let's make plans! If John is able to do your event, Deirdre will be in touch to make arrangements with you about the timing, subject of the painting, raffling/auction for fundraiser occasions), and/or any other details that need to be sorted out in advance. If you want to get into the creative details, you have the option of being in touch with John directly to make specific plans about the painting itself! On your end, you'll just need to have an idea of where John should set up at your venue, and allot about 4x6' - 5x8' for him to work in. Enjoy Fine Art in Real Time! On the day of your event, John will arrive 1-3 hours early (depending on what we've agreed upon in step 2) to set up his painting area. He'll then paint for your and your guests' enjoyment, so that you can see his whole process. He welcomes questions and is happy to interact with everyone - yes, he really can talk and paint at the same time! It's a lot of fun! Receive your Fine Art: If you are purchasing the painting, or if the painting is going to one of your guests (for raffling/auction option): John will take the painting back to his studio for finishing touches, signature, and cataloguing. It will ship to the appropriate party (as arranged in step 2) between two to four weeks following the event. Then you hang it up and show it off and tell everyone who sees it about how your guests watched the artist create it at your special event. A deposit (25-50%) is due upon booking John. The cost of the remainder for John's Live Painting services is due on the day of the event. If you purchase the painting, the payment for the painting is due when the painting is ready (Deirdre will let you know!) and it will ship when payment is received. We receive payments via check and online. We won't know the precise amount until we've discussed the details of what exactly you're looking for from your Live Painting experience. We can give you an accurate estimate after a quick conversation over the phone or via email. When you choose John for your event, you're choosing his Classically-trained background, his materials, his travel, his setup and take-down time, his shipping and handling costs, his warmth, friendliness, and informativeness towards your guests, his wife & business manager taking care of the details before and after the day -- and, most of all, the enriching experience of watching him work live. ​We aim to make the whole process as simple, pleasant, and enjoyable for you as possible!